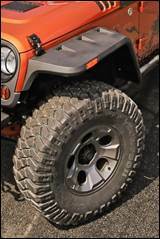 Suwanee, Ga. (October 24, 2013) – Jeep® enthusiasts can now get an aggressive never-before-seen off-road look for their ’07-’14 Jeep Wrangler JK with the introduction of Rugged Ridge’s newly designed Hurricane Flat Fender Flares. Drawing inspiration from the company’s own historical Jeep Collection, the Rugged Ridge Hurricane Flat Fender Flares combine the popular modern pocket style with the traditional flat fender design first found on the 1941 Willys MA. Each new Hurricane Flat Fender Flare incorporates a unique double bolt pocket that updates the classic pocket flare design. Engineered for both form and function, the fender flare’s unique shape is built to complement the Wrangler’s body, resting high on the vehicle and providing extra clearance for oversized wheels and tires while on trails, and protecting the vehicle’s paint from flying rocks, mud and any other elements found outdoors. Each flare is constructed from durable black TPE plastic that can be left unfinished or painted to match the factory paint. Included with each purchase are two sets of durable corrosion resistant fasteners, one stainless steel and one black so owners can personalize the final look to their own tastes. The fender flares are priced from $499.99 and are backed by an industry-leading, five-year limited warranty. For more information about Rugged Ridge’s complete line of high-quality Jeep and off-road products, or to find an authorized retailer, please contact Rugged Ridge at (770) 614-6101 or visit its website atwww.RuggedRidge.com. Omix-ADA®, Inc. is one of the world’s largest independent manufacturers and wholesaler of Jeep®, truck and off-road parts, accessories and floor liners. For nearly two decades, Omix-ADA has designed, tested, manufactured or distributed more than 15,000 of the highest quality restoration and replacement parts and accessories. The Omix-ADA family of brands, Rugged Ridge®, Alloy USA®, Outland Automotive® and Precision Gear® are distributed throughout the USA and in more than 60 countries worldwide. For more information, please call Omix-ADA, headquartered in Suwanee, GA at 770-614-6101 or visit www.omix-ada.com.